Episode 1 – Messages from Light Beings. Discussion: Humanity’s relationship to Oneness, Light Beings, Guardian Angels, & Spirit Guides. Episode 2 – Sacred Healing. Healing in a sacred manner, open heart – sincere desire, in the presence of spirit guides & guardian angels, using golden light & consciousness, quantum physics. Learning to love oneself. Episode 3 – Evolution of Consciousness. July 2014. Missed it? 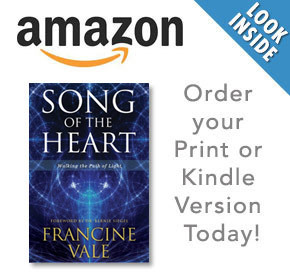 Booktrib chats with Francine Vale about her book Song of the Heart where she talks about her journey to live an authentic life. In this video Francine’s voice is still healing from thyroid surgery few days prior.